In the ISST- training we will enlighten various scoliosis specific theoretical aspects in combination with practical parts of the therapy approach. The course leads from the surface of scoliosis understanding to a more sophisticated and comprehensive clinical reasoning regarding the conservative management for scoliosis. The Schroth training enables physical therapists to provide a sufficient conservative treatment for patients with spinal deviations mainly for idiopathic scoliosis and kyphosis. The goal is to prevent surgery, decelerate or stop the progression and develop effective coping strategies for the patients to improve their social participation and activities in their daily living. This has also a positive effect on the general HQL (health related quality of live) for children, adults and elderly patients suffering from scoliosis and kyphosis. The training enables PT´s to understand the biomechanical conditions of the asymmetric postural aspects and asymmetric loading of the spine leading to functional and structural adaptations and a further risk of progression. Specific physical therapy techniques are also indicated for patients in brace and for patients requiring surgery and after surgery. Therapists learn to define their role as team players in an interdisciplinary network with physicians, surgeons, orthopaedic technicians (orthotists), parents, patients and psychologists. There will be a written examination at the end of part I. The certification authorizes for the ISST treatment according to the concept of Katharina Schroth but does not permit to teach other professionals the method. In case of non-compliance, the certification and the status ISST Schroth therapist will be deprived. To pass a written and practical exam is required to get the ISST certification. In the practical exam, the student has to prepare a therapy plan for a fictional patient including therapy diagram, scoliometer data, standardized exercise program and an evaluation of the risk of progression. In a second part the therapist presents his patient with his/her typical features and selected elements of the treatment program. 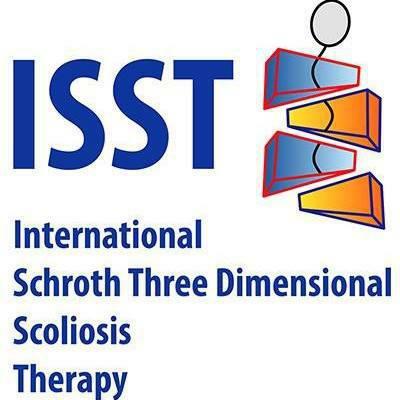 Therapists who complete the full certification course and examination will be listed as Certified ISST-Schroth Therapist on the Spine Concept Sobernheim ISST website. Continuous Education Credits (CEC): To keep the certificate valid ISST Schroth therapists have to participate in ISST refresher courses within 3yr after the last renewal. The refresher courses were organized either by the regional instructors or the senior instructor. Participants can freely choose refresher courses approved by the S-C-S Training institute in different regions.